15% Student Discount on Orders at adidas Make a saving on your favourite styles at adidas. Students now receive a mighty 15% off, shop now! Free Returns on Orders at adidas If for any reason you aren't quite satisfied with your purchase, don't worry! you can return your order within 30 days for free. Free Welcome Gift with Newsletter Sign-ups at adidas Sign up to the adidas newsletter now for updates on new collections and exclusive offers and receive a free welcome gift. 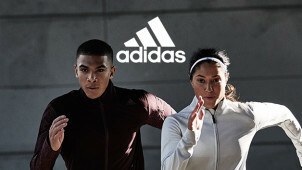 Free Click and Collect on Orders at adidas Take advantage of free click and collect on your adidas order today. New In Ultraboost Collection at adidas Attention all runners! The only shoe you need to train in this year has arrived at adidas. Shop the Ultraboost collection now! Adidas is that global sports brand that lets you be who you want to be. With sports routed into its culture, adidas aims to nurture the creative and cunning in the fitness game. Now you can test your limits and out-perform yourself - with us you will even make savings on gear that'll make you go that extra mile. Whether you're an amateur sports player, a pro or perhaps you simply enjoy a more sporty street style - adidas has got the goods you need to make you feel your best. With a focus on quality, stylish attire with inbuilt technology that's been developed from the latest research in the sporting game - this is where the fun begins. When adidas outdoes itself with every new collection release - there's a reason why football stars and sport icons trust in adidas. Now you can be a part of it, now your sport has no limits. How do I use my Adidas discount code? Click ‘Apply’ and see the discount applied to your order total straight away. Sign up to the adidas mailing list today to be the first to hear about news and promotions; you'll even get a welcome gift. Does Adidas do student discount? Yes! Adidas student discount of 15% off online is available if you have a StudentBeans account. Does Adidas do Click & Collect? Yes, Click & Collect with Adidas is free. Does Adidas do free delivery? Yes, delivery with Adidas is free if spending more than £50. Standard delivery costs £3.95. Will Superstar trainers go in to the Adidas Black Friday sale? If you’ve been holding out for the right deal on your Adidas superstar trainers, on a jazzy jacket or another of Adidas’s cool clothing and accessories, you know you’ll find a good deal with us, but it’s no secret that you’re likely to find a great one come Black Friday too! While we can’t tell you exactly what items will be included, you’re sure to bag yourself a really sweet Adidas Black Friday deal! Yes, you can log into your account to do so or check the order tracker. Adidas are happy to accept returns within 30 days of receiving your purchases. So, if you have changed your mind or are not happy with your order, it’s easy to receive a refund. Unwanted products can be returned if they are unworn and undamaged by simply completing the returns slip and using the address label included with your order’s invoice. To read the full terms and conditions for Adidas returns, click here. Standard Delivery is free over £50 - arrives within 3-4 working days. Standard Delivery costs £3.95 below £50. Returns are free - simply print out a return form and label via the order tracker and include it with your parcel (along with the items in their original packaging). You can return items within 100 days of receiving your order. You can also reach customer services online via the Adidas website. Real Madrid officially weren’t the only ones to dominate Europe in the 2016/17 season. 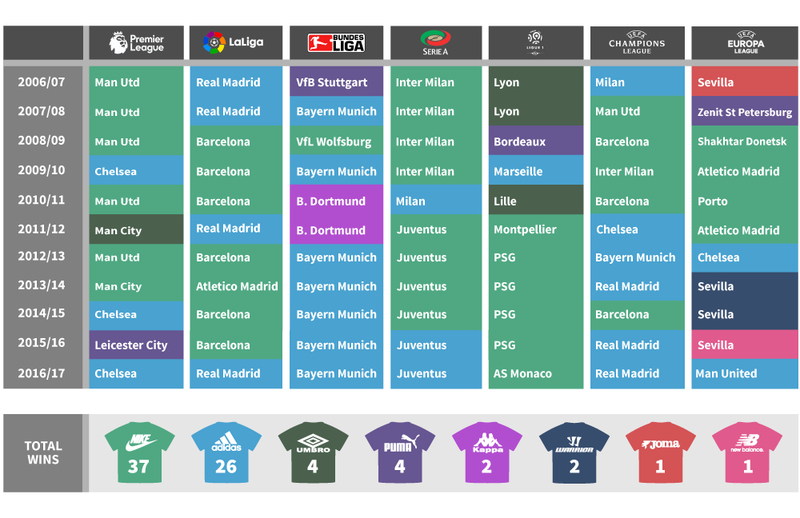 New research has shown that Adidas almost took a clean sweep of the major European football titles - as kit sponsors. In fact, six out of seven major European tournaments - The Premier League, La Liga, the Bundesliga, Serie A, and both the Europa League and Champions League - were all won by teams wearing adidas-branded kits. In the 16/17 season, only Ligue 1 - the Nike-sponsored Monaco - upset the perfect season. The research, conducted by money-saving brand vouchercloud, also revealed that Nike are still the dominant kit sponsor of the last eleven years, winning 37 of a possible 77 titles. In comparison, adidas have only claimed 26 total, with the likes of Umbro (4) and Puma (4) trailing in their wake. However, that balance is shifting; adidas have outscored Nike over the last five seasons by 16 titles to 15. The dominance of Nike and adidas is more profound than ever too, as 2016/17 was one of only three seasons where adidas and Nike claimed every title; Leicester’s shock Premier League title last season, for example, offered up a victory to Puma, while New Balance won their first ever European Title when Sevilla retained the Europa League in 2015/16. However, the battle to sponsor Europe’s elite teams is a hotly contested one. Chelsea - who helped adidas in their near clean-sweep last season - have signed a £60m-a-year deal with Nike for next season, lasting until 2032. Adidas only narrowly escaped losing Spanish giants Real Madrid this year, too. Under Armour famously walked away from a £130m-a-year deal, allowing adidas to sign for a 5th year for just £34m-a-season (while rivals Barcelona continued their £140m per season contract, signed with Nike in October 2016). Under Armour have long been trying to break into the competitive - and lucrative - world of the elite football kit sponsors, yet were still unlucky not to make an appearance on this table - their £10m-a-year sponsorship deal with Tottenham saw them narrowly miss out on the Premier League title this season before Nike swooped in with a £25m-a-year new deal for 2017/18. … though that’s still £35m-a-year less than London rivals Chelsea, and a whopping £50m-a-year less than Adidas-sponsored Man Utd. Adidas is that household name of the sporting world; offering men, women and children variety in their clothing and accessories to support every kind of active lifestyle this season and beyond. With an adidas discount code from vouchercloud, we’ll help you save money on your next pair of football boots or adidas trainers, as well as other sporting attire and accessories. Here at vouchercloud we regularly have fantastic discounts for adidas UK, including 15% off adidas promo codes and up to 30% savings in the adidas sale. From running shoes and football boots to headbands and baseball caps, you can dress from head to toe in adidas gear and save yourself some cash in the process. Have a sporty season with Adidas. Whether you're into football, rugby, basketball or more - adidas has a dedicated category for each of these. So it's easy to get kitted out with the best in the business, especially when you use an adidas promo code from us. Just knowing that many famous sports' players opt for this brand too is a sign that here you're shopping like a pro. For our footwear, apparel and equipment - we think adidas.